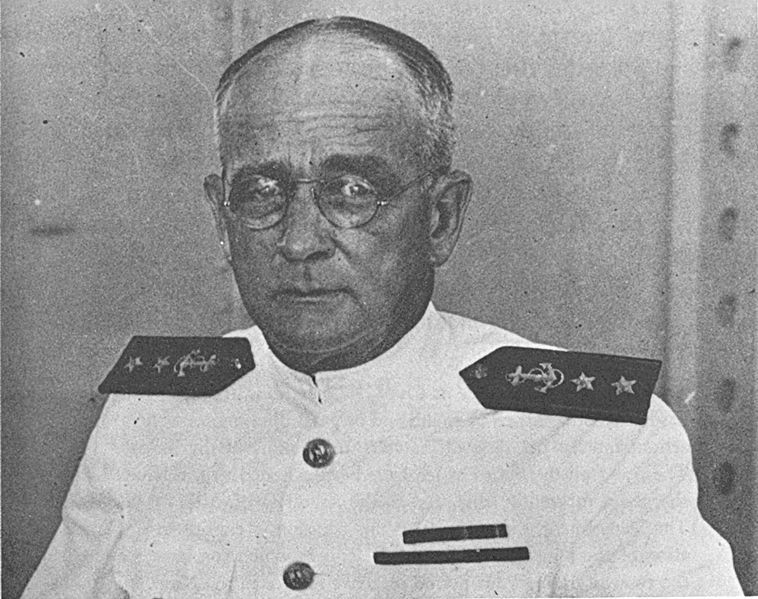 Arthur Japy Hepburn (October 15, 1877-May 31, 1964) was an admiral in the United States Navy, whose active-duty career included service in the Spanish-American War, World War I, and World War II. He held a number of high posts in the years between the World Wars, including Director of Naval Intelligence, a U.S. representative to arms control conferences, and Commander in Chief of the United States Fleet. He was born on October 15, 1877 in Carlisle, Pennsylvania. He graduated from the Naval Academy in 1897 and served in the Spanish-American War. He participated in the defeat of Admiral Cervera's Spanish Squadron off Santiago, Cuba and was subsequently commissioned at the rank of Ensign. Thereafter, Hepburn assisted in surveys of the Pacific and performed a variety of other duties, until the First World War, where he commanded the seized German liner Kaiser Wilhelm II and as a submarine commander, until he was ordered to Europe in July 1918 to command the naval base at Queenstown, Ireland. After the armistice, he served in Chester, inspecting German naval ships and aircraft as set out in the terms of the Armistice Treaty. In 1919 he was appointed the Assistant Chief of the Bureau of Steam Engineering, until 1922 when he became Chief of Staff of the American Naval Detachment in Turkey. Thereafter, he served a wide variety of important posts. He took command of the battleship USS West Virginia (BB-48) in May, 1925; became Director of Naval Intelligence in July, 1926; he served as Chief of Staff with Battle Fleet and U.S. Fleet from 1927 to 1930; and in May, 1931 he took command of Submarine Forces, U.S. Fleet. Between 1932 and 1933, he served as a naval member to the Limitations of Arms Conference as Naval Adviser to the Geneva Delegation in Switzerland and as the American Representative at the London Naval Conference. After commanding the 4th Naval District, and destroyers of the U.S. Fleet, he became Commander in Chief of the entire U.S. Fleet on June 24, 1936, at the rank of Admiral. In the years leading up to the Second World War, as it became increasingly clear that international relations were deterioriating, Hepburn was charged with the task of heading the board (eventually known as the "Hepburn Board") which reviewed the United States defense capabilities. The "Hepburn Board Report" served as the basis for the massive U.S. defense expansion of the late 1930s. In 1942, Hepburn was appointed Chairman of the General Board of the Navy, serving in that capacity throughout the war. He also later served as a delegate to the Dumbarton Oaks meetings, which established guidelines for founding the United Nations. Hepburn retired in December, 1945. He died on May 31, 1964. 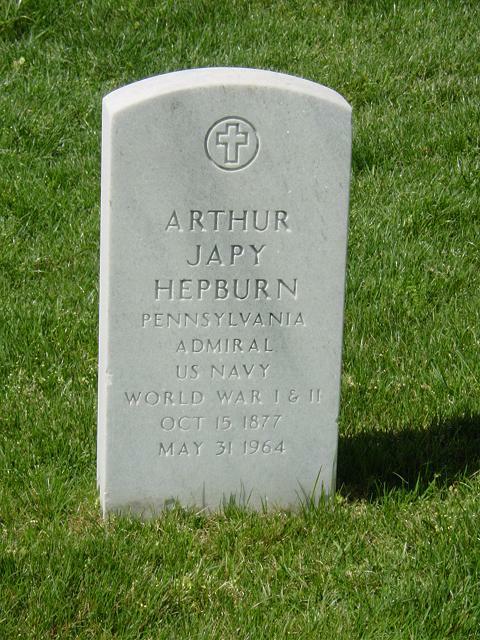 WASHINGTON, May 31, 1964 – Admiral Arthur Japy Hepburn, USN, retired, Commander-in-Chief of the United States Fleet from 1936 to 1938, died here today at the age of 86. Admiral Hepburn had been Chairman of the Navy General Board for three years before his retirement in 1945. He was a delegate to the Dumbarton Oaks Conventions in 1944 that helped lay the foundation for the United Nations, and was senior naval adviser to the United Nations Conference in San Francisco the next year. A graduate of the Naval Academy in 1897, Admiral Hepburn was a veteran of three wars. He served as an Ensign in the Spanish-American War, as commander of the battleship South Carolina and other fleet units in World War I and was the Navy’s first director of public relations in World War II. He became a Rear Admiral in 1929 and was promoted to Admiral in 1936 when he became the fleet commander. He had been Assistant Chief of the Bureau of Engineering, Chief of Staff of the United States Naval Forces in Turkey and Naval Adviser to disarmament conferences in Geneva and London. From 1938 to 1941, Admiral Hepburn was commandant of the 12th Naval District in San Francisco. He then retired, but after Pearl Harbor was recalled to active duty. Born in Carlisle, Pennsylvania, he attended Dickinson College before entering the Naval Academy and later earned an honorary LL.D degree there. The Admiral’s wife, the former Louisa Lowndes Roman, died in 1933. In 1950 he married Miss Agnes McMahon. Also surviving are a son, Philip Roman Hepburn, and three grandchildren. A military service here at A.M. Tuesday will be followed by burial in Arlington National Cemetery. Posted: 10 December 2006 Updated: 7 July 2007 Updated: 24 January 2008 Updated: 8 July 2009 .